Before you begin, roast the peppers under the broiler, turning frequently, until charred black spots dot the exterior all over. Remove and place in a brown paper bag to cool. If your andouille still needs to be cooked, do that now, reserving the pan with the leftover fat after they're finished cooking. Add the chopped onion to the pan you cooked the sausage in. Season with salt and pepper. Cook over medium-high heat until very soft and translucent, about 8 minutes. Add the garlic; cook an additional minute. Move the cooked onion and garlic into a tall, narrower bowl, or ideally the container that came with your immersion blender. (If you don't have an immersion blender, a food processor or blender will work just as well — just place the ingredients in your processor work bowl or blender). Add the chipotle peppers, paprika, and vegetable broth to the rest of the ingredients; blend well, until no visible chunks are present. Taste your sauce and adjust the seasoning if you need to. Set aside. Heat the olive oil in a skillet over medium-low heat. Add the chopped onion and cook until caramelized. Prepare the grits according to the package directions for six people. About a minute before the grits are finished cooking, add the sausage, caramelized onion, and the log of goat cheese; stir until thoroughly incorporated. Set over a warming (or low heat) burner until you're ready to serve. Add the sauce (recipe above) to a large skillet (you can reuse the one you caramelized the onions in if it's large enough) and bring to a low simmer. Add the shrimp to the sauce and cook until the shrimp change color to a pink hue. Make sure to flip them all over halfway through so that they cook evenly. This shouldn't take more than five minutes. 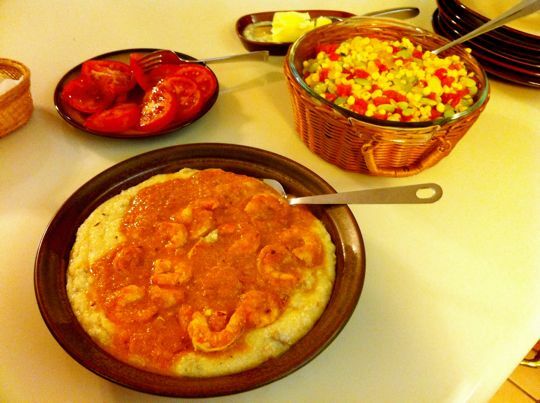 Serve shrimp with sauce over the grits in a large shallow serving bowl or individual bowls.